Landscaping a garden is hard work. First of all there are so many different styles that you have to choose between. If you want to add some style, sophistication and history to your back garden you can’t go wrong with a courtyard. Originally conceived of as open spaces within homes, these areas are now incredibly popular as gardens. Read on for some ideas for creating your own courtyard garden. Its all well and good finding out what you can fit in your outdoor space, but the most important factor is what you want to use your courtyard garden for. Are you planning on using it for night time dining or entertaining? Perhaps you should consider installing lights that have cables which are hidden from the elements. If you want to entice animals into your garden, you should think about adding the right flowers and plants, or perhaps a pond or a bird table. One of the best things about a courtyard garden is that it can be created within whatever space you have, no matter how small it is. However, if you have limited space, you will also have limited choice with regards to the garden. The best way to maximise on space in a small courtyard garden is to pave the entire area and use it as an extra section of entertaining space. These are particularly lovely in the summer months and make perfect locations for barbecues with family and friends. Of course, if you have a large expanse of space available you can do pretty much whatever you’d like. Add a lawn, install a water feature, have a paved area for outdoor dining, the choice is completely yours. If you have enough space you could even consider installing a swimming pool. The only limit is your imagination. When you are deciding on the colour scheme of the flowers in your garden, be careful if your space is small. Adding any plants that are vibrant in colour will only make the space appear smaller and more claustrophobic. Stick to pastel colours or simple greenery to avoid this. If you admire the courtyards of China and Iran or are a fan of Victorian architecture, you may want to incorporate some of their features into your brick and stonework. You could even go hunting for some antique pillars or tiles to make your courtyard garden as authentic as possible. Alternatively, you could go in another direction and simply take the idea of the courtyard and modernise it. If you like the idea of privacy but also like the idea of a view, you could even install a window into the courtyard’s back wall. Courtyards are typically classed as outdoor enclosures, you can leave the roof open and exposed to the elements or you can make it more like a conservatory and add a glass roof, which will still let in light but not rain or wind. If you are short of ideas, or have only seen small examples of courtyard gardens in magazines or books, take some real life inspiration by visiting some of the most famous stately homes in the UK. Estates such as Hampton Court and Castle Kennedy have numerous courtyard and wall gardens that you can visit and enjoy. There is nothing stopping you from taking photos on your day out and using them to inspire the brickwork, paving or even the planting of shrubs or flowers within your own courtyard garden. Some of these stately homes even have gift shops that sell seed packets for some of the simpler plants that are found in the garden and also sell mementos that can be installed within your garden to evoke the spirit of the place. Before you get to work, you may need to obtain planning permission, so check with your local Council first. This may seem odd as you will only be building a small structure on your garden, but the fact is that you will still be building as your own contractor. If you don’t get proper planning permission you could be given a substantial fine, and in the worst cases will also have to take down your new structure. If you don’t think that you could do justice to your own design, you could always hire a contractor. There are a number of contractors who can erect your courtyard across the UK. Before you sign any contracts for work, make sure that the contractor is qualified to do the work and has proven experience with this type of building. It will cost you significantly more money to have your garden professionally built, but you will be able to rest assured that the work has been done to the highest standards. 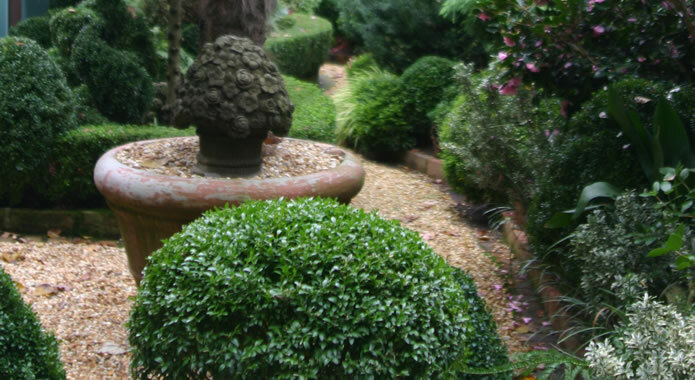 If you have some ideas of what you would like, but don’t have a fixed design in your head, you can also ask your contractor to produce one for you with great consideration to the dimensions of your garden. If you are going down the DIY route and are trying to complete your courtyard garden on a budget, but still want to achieve an authentic courtyard feel, there are ways to get around the steep prices. Go to online auction sites to see if anything is available to complete your design, you’d be surprised by the sheer variety of things that do get sold on these sites. Visit antique shops and reclamation yards in your area too. The larger outlets often have sections that are specifically dedicated to outdoor building and living. Make sure that you have a fixed idea in your head before you start the work. Courtyard gardens are one of the most structured gardens you could ever want to design. Also remember that to keep the garden at its best, it will require some maintenance. If you want a garden that requires minimal or no work, you should probably consider alternative options. There are quite a few open to you.